The specs needed to just power a VR headset are painfully high, so it stands to reason that the hardware used by developers to make those games will need to be something special. 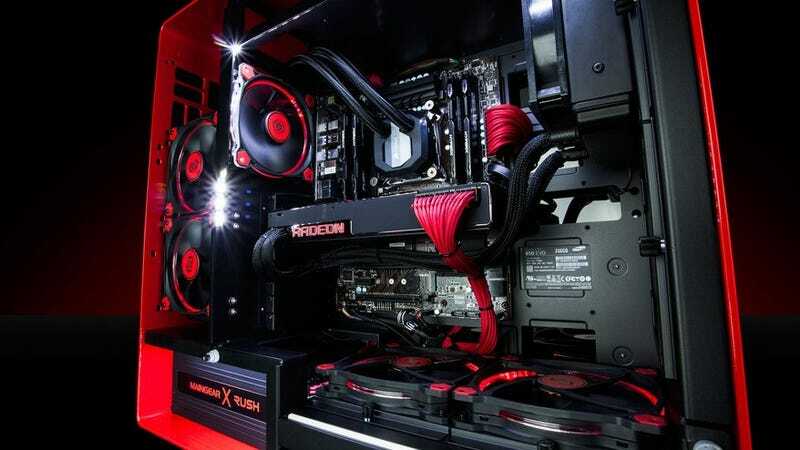 That’s what AMD is trying to deliver with its new Radeon Pro Duo, unveiled at the Game Developer’s Conference today. The new card is challenging for the title of “most powerful singe graphics card in the world,” using one simple trick: cramming two GPUs onto one board. That means 16 teraflops of computing power, way up from Nvidia’s Titan X card, which delivers 7 teraflops. Yes, that’s a linear scale, so yes, it’s a big jump up. It’s not a game-changer in terms of the amount of power you can fit into one build, though: the hardware of the Pro Duo is basically two AMD Fury X cards working together, something that’s very easy to do right now, if you have a big case and $1,200 to spare. Speaking of money: the Pro Duo isn’t cheap, selling for $1,500. The high price reflects the people AMD is aiming this card at, namely game developers working on titles in VR. Sure, you could use the Pro Duo to play games on an Oculus Rift (or two!) quite happily, but there’s not much point for the average consumer. Still, it’s nice to have something to aspire to in life.